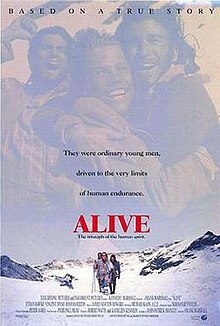 Alive is a 1993 American biographical survival drama film based on Piers Paul Read's 1974 book Alive: The Story of the Andes Survivors, which details a Uruguayan rugby team's crash aboard Uruguayan Air Force Flight 571 into the Andes mountains on Friday, October 13, 1972. Filmed on location in the Purcell Mountains in British Columbia, the film was directed by Frank Marshall, written by John Patrick Shanley, and narrated by John Malkovich. It features an ensemble cast including Ethan Hawke, Josh Hamilton, Vincent Spano, Bruce Ramsay, John Haymes Newton, Illeana Douglas, and Danny Nucci. One of the survivors, Nando Parrado (portrayed by Hawke in the film), served as the technical advisor for the film. The film opens with a group of photographs of the Stella Maris College's Old Christians Rugby Team. Carlitos Páez points out several members of the team and reflects on the accident in a brief monologue. Uruguayan Air Force Flight 571 flies over the Andes on October 13, 1972. The raucous rugby players and a few of their relatives and friends are eagerly looking forward to an upcoming match in Chile. Upon emerging from clouds, the plane encounters turbulence and collides with a mountain. The wings and tail are separated from the fuselage, which slides down a mountain slope before coming to a stop. Six passengers and one flight attendant are ejected from the plane and die. Antonio, the team captain, coordinates efforts to help the injured. Roberto Canessa and Gustavo Zerbino, both medical students, aid the injured. Another six passengers soon die, including both pilots and Nando's mother, Eugenia. Nando, who sustained a head injury, falls into a coma, and his sister Susana has suffered harsh internal injuries. As the sun sets, the survivors make preparations for the night. Canessa discovers that the seat covers can be unzipped and used as blankets. The survivors go inside the fuselage and curl up beside one another to stay warm. Antonio, Roy Harley, and Rafael Cano plug the gaping hole at the end of the fuselage with luggage to keep out the wind. Two passengers die overnight. With nothing to hunt or gather on the mountain, Antonio declares they will use rationing when the survivors find a tin of chocolates and a case of wine. After seeing a plane fly past, they think it dips its wing, and the survivors celebrate. Expecting to be rescued the next day, everyone except Javier, his wife Liliana, and Antonio eat the remaining chocolates. This causes a quarrel among Antonio and several others. Nando regains consciousness. After learning of his mother's death, Nando watches over Susana vigilantly. Knowing she will die of her injuries within a few days, he vows to set off on foot and find a way out of the mountains. When Carlitos reminds him that he will need food, Nando suggests eating the flesh of the deceased pilots to give him the strength to survive the journey to find help. Susana dies from her injuries. The survivors listen to a radio for word of their rescue but are devastated to hear the search called off after nine days. After great debate, the starving passengers decide to eat the flesh of their dead relatives and friends. Zerbino, Rafael, and Juan Martino set off to search for the tail of the plane in hopes of finding batteries for the plane's radio to transmit their location. Among pieces of the wreckage, the teammates find additional corpses, but return to the group with news that the tail of the plane is likely a little farther away. Later in the week, an avalanche strikes the plane and fills much of the interior with snow. Eight of the survivors are smothered by the snow or freeze to death. A second team, made up of Nando, Canessa, and Antonio "Tintin" Vizintin, sets out and find the tail of the plane. Unable to bring the batteries to the fuselage, they return to the fuselage to get Roy, who is thought to have experience with electrical equipment. They bring him to the tail of the plane to see whether he can fix the radio. When Roy is unsuccessful, the team returns to the fuselage. Federico and Alberto die from their injuries, as does Rafael, leading Nando to convince a reluctant Canessa to search for a way out of the mountains, taking Tintin with them. Two days into the journey, they send Tintin back to the fuselage so they can appropriate his rations and continue on their own. After a 12-day trek, the two escape the mountains and alert the authorities of their companions' location. As helicopters land on the mountain, the remaining 14 survivors celebrate. In the present, Carlitos describes how the survivors later returned to the site of the crash and buried the corpses under a pile of stones, marked with a cross. The memorial to the 29 deceased and 16 survivors is shown. Rotten Tomatoes, a review aggregator, reports that 62% of 26 surveyed critics gave the film a positive review; the average rating is 6.1/10. David Ansen of Newsweek said that, while, "Piers Paul Read's acclaimed book ... paid special attention to the social structure that evolved among the group ... Marshall ... downplays the fascinating sociological details—and the ambiguities of character—in favor of action, heroism and a vague religiosity that's sprinkled over the story like powdered sugar." Others, such as Ray Green, praised the tactful nature of the film stating that, "despite the potential for lurid sensationalism, Marshall manages to keep his and the film's dignity by steering an effectively downbeat course through some grim goings on thanks in no small manner to the almost allegorical ring of Shanley's stylized dialogue." Green continues by describing the film as, "thrilling and engrossing as it is at times, Alive is more than an action film—in its own way it is also a drama of ideas, and of the human spirit as well." Roger Ebert wrote "There are some stories you simply can't tell. The story of the Andes survivors may be one of them." He also questioned the realism of how normal the actors' bodies looked after portraying two months of near starvation. A companion documentary, Alive: 20 Years Later, was released at the same time as the film. It includes interviews with the survivors, as well as documentary footage of the rescue. The 30th Anniversary Edition of Alive: The Miracle of the Andes (on DVD) includes this documentary in the Extras section. ^ "Alive (1993) - Financial Information". ^ "Alive (1993) - Box Office Mojo". Box Office Mojo. Retrieved 2010-02-17. ^ Maslin, Janet. "Reviews/Film; Tasteful Cannibalism As Upbeat Viewing". ^ "Alive Movie Reviews - Rotten Tomatoes". Rotten Tomatoes. Retrieved 2015-09-18. ^ Ansen, David (January 18, 1993). "Hot And Cold Survival Skills Newsweek.com". Newsweek. Retrieved 2010-02-17. ^ Green, Ray. "Alive." Box Office (March 1993). ^ a b Ebert, Roger (January 15, 1993). "Alive Review". Chicago Sun-Times. Retrieved 2008-06-17.